While I expected the chariot race to be exciting, I was surprised at how well-executed I found the crucifixion segments that end the film to be. Although Ben-Hur tends to be schmaltzy, that problem seemed largely absent during the climactic segments. Actually, there’s some cheese on hand, but I still thought the Christ-related parts that finish the movie to seem pretty moving. 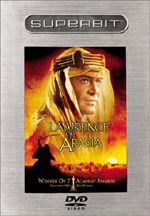 Ben-Hur appears in an aspect ratio of approximately 2.76:1 on these single-sided, double-layered DVDs; the image has been enhanced for 16X9 televisions. Yes, those dimensions are correct; this sucker’s wiiiiiiiiide! It’s both the best movie and the worst movie to use in attempts to convert “black bar” hating friends and relatives. On one hand, the pan and scan rendition offers the visual equivalent of gibberish; more than half of the original image is lost. However, since some people freak out when mild bars appear for 1.85:1 films, I can’t imagine how they’d react to this! Sharpness seemed quite strong. Despite the many wide shots and the relatively-minuscule nature of lots of onscreen objects, the picture appeared very crisp and well-defined at all times. Even the smallest items came across as clear and detailed. Shockingly, I detected virtually no signs of jagged edges or moiré effects. Given the complexity of the image, I expected to see at least a little shimmering, but those problems seemed almost totally absent. Even when objects that tend to “strobe” appeared, they maintained a solid and tight appearance; this was a very stable picture. Colors looked consistently vivid and well-saturated. Skin tones occasionally took on a slightly brownish appearance, but for the most part they seemed acceptably natural and accurate, while other hues were wonderfully portrayed. Reds appeared especially bright and rich. Black levels came across as deep and dense, while shadow detail looked appropriately heavy but never excessively thick; low-light situations were easily discernible at all times. Virtually no source defects appeared. I noticed maybe one of two small specks at most. Otherwise the movie came free from flaws. Put bluntly, this was an outstanding transfer that looked like it was shot yesterday. Ben-Hur also sounded quite good via the movie’s Dolby Digital 5.1 audio. The film featured a modestly involving soundfield that helped make the program more compelling. The forward channels displayed a nicely broad mix during much of the movie. Music showed solid stereo separation, and quite a few directional effects came from the sides. These also moved across the speakers and blended together fairly well; the imaging could be a little awkward at times, but given the vintage of the material, the transitions worked well. A modicum of dialogue also came from the side speakers, though this effect was limited; very little speech emanated directly from one channel or the other, and most sounded as though it appeared in a mid-zone between speakers. Surround usage was somewhat limited though it worked well given the age of the film. The score was nicely bolstered by the rear channels, as they added a strong dimension of reinforcement to the music. During some of the louder scenes, the back speakers also contributed fairly engulfing atmospheric effects. For example, thunder enveloped me, and the chariot race came across very well. Ultimately, the track sounded unsurprisingly dated, but it provided a relatively positive soundfield nonetheless. Music appeared quite bright and vivid. Highs usually sounded clear and crisp, and the score boasted some surprisingly well-defined and deep bass at times. For example, the drums at the start of chapter 13 appeared quite resonant. Ultimately, the soundtrack to Ben-Hur presented a very positive auditory experience. How did the picture and audio of this 2005 Ben-Hur compare to the original 2001 DVD? Both offered improvements, though many similarities occurred. In both cases, I thought the 2005 version cleaned up matters a bit. This meant we lost the minor source flaws of the original and the sound seemed a bit more detailed and concise. The improvements weren’t massive, as the prior DVD already looked and sounded terrific, but the 2005 release nonetheless made a good thing even better. More changes come when we look at the supplements found on this Four-Disc Collector’s Edition. The old release had a few good components, but this one adds nice elements to that collection. I’ll note new materials with an asterisk. On DVDs One and Two, we start with an *audio commentary by film historian T. Gene Hatcher and actor Charlton Heston. They don’t sit together, and Heston’s parts come from the original DVD. The actor fills roughly one-third of the movie, and Hatcher covers the rest. Heston also covers a lot of ground. He goes from technical details of the production to anecdotes from the set to notes about coworkers. Some of the same material gets repeated on occasion, but as a whole, Heston manages to keep most of the track fresh and compelling, especially when we get to the chariot race; Heston becomes most active at that time, and he adds a lot of solid remarks. He spends a little too much time telling us how good different actors and scenes were, but I really liked the commentary nonetheless, as it provided a strong look at the film. The two pieces mesh neatly and add up to a strong piece. Also spread across DVDs One and Two, we find an *Isolated Score. This presents all of Miklos Rozsa’s music in stereo. A full 5.1 track would have been nice, but this remains a positive extra. DVD Three contains one element: the 1925 Silent Version of Ben-Hur. The film runs about 143 minutes. This edition is interesting to see as a curiosity, though it doesn’t entertain terribly well. Actually, it seems pretty advanced for its era, and it’s clear that the 1959 version borrowed some elements from it. The pair follow fairly similar story paths until toward the end, when they begin to differ more strongly. 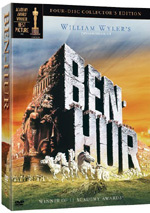 Devoted totally to extras, DVD Four starts with a fine 1993 documentary called Ben-Hur: The Making of an Epic. Narrated by Christopher Plummer, this 58-minute and five-second program provides a solid look at the history of the project. It covers the story’s origins in the 19th century and follows it through earlier stage and screen presentations. We learn a surprisingly detailed account of the 1925 film edition’s creation. Of course, the show also discusses all important elements related to the filming of the 1959 version well. It offers a lot of compelling information about cast, crew, story, script, locations, sets, stunts, music, effects and pretty much everything else you’d want covered all the way up to the flick’s release. It does so through film clips, outtakes, behind the scenes material from the set, and interviews with film historian Rudy Behlmer, author Gore Vidal, MGM executive JJ Cohn, actor Ramon Navarro, director William Wyler, director’s daughter Catherine Wyler, editor Ralph Winters, art director’s son Edward Carfagno Jr., special effects director Richard Edlund, composer David Raksin, stunt man Joe Canutt, and second unit director Yakima Canutt. It’s a frank, funny and informative piece that kept me consistently involved and entertained. A new documentary entitled *Ben-Hur: The Epic That Changed Cinema pops up here. It runs 57 minutes, 40 seconds and includes remarks from Wyler, Heston, film historian Bruce Crawford, producer Arnon Milchan, directors George Lucas, Ridley Scott, Robert Dalva, Ernest Dickerson, and Irvin Kershner, film editor/sound designer Ben Burtt, actor’s son Fraser Heston, production designs Anthony Pratt and Arthur Max, composers Elia Cmiral and Don Davis, cinematographers Caleb Deschanel and Janusz Kaminski, costume designer Sharen Davis, editor Joel Cox, and actor Michael Douglas. At its best, “Epic” provides a rich examination of the film’s impact. It’s one thing to know that Lucas and Scott borrowed from Hur, but it’s another to here them chat about it. The technical workers offer good notes about the flick’s innovations and they way they do their jobs. For a collection of stills and a few other materials, we go to *Ben-Hur: A Journey Through Pictures. 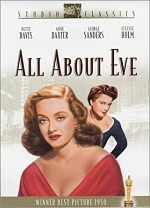 This running five-minute and six-second piece shows production and publicity photos as we hear music and audio from the film. We also see other bits like drawings, musical charts and ads along with a few movie clips and a behind the scenes snippet or two. I’m not wild about the format and don’t think this is a particularly effective program. In *Screen Tests, we see longer examples of some of the material found during the “Making of…” documentary. We get footage with Cesare Denova as Ben-Hur and Leslie Nielsen as Messala; these last a total of six minutes and 55 seconds. Nielsen shows up again in a silent 11-minute and 22-second piece that pairs him with Yale Wexler as Judah. In the *Vintage Newsreels area, we locate six clips. These run a total of nine and a half minutes through the “Play All” option. We see premieres in NYC, LA, DC, Tokyo, and a summary of the Oscars. The first short shows Heston as he greets moviegoers in New York. That one’s the most fun, though as a local, I like the DC clip since it gives us a good look at the legendary Uptown Theater. For the final disc-based component, we find *Highlights from the 4/4/1960 Academy Awards Ceremony. It fills nine minutes, 43 seconds and shows many of the evening’s award presentations. The sound cuts in and out to cause a few problems, but most of the program comes with sound. This offers a better look at the ceremony than the usual newsreel, so it’s worth a look. Finally, the package includes a 36-page *booklet. 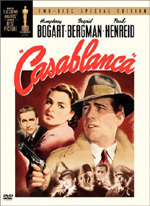 This replicates the program that accompanied the movie’s theatrical run. It mixes photos and many behind the scenes tidbits along with credits and other information. It adds a very nice touch to this stellar package. More than 40 years after its initial release, Ben-Hur remains the definition of a screen epic. As a film, it still has a lot to offer - particularly in the excellent chariot race sequence - but some other elements haven’t aged quite as well. The DVD appears quite fresh, however. It provides excellent picture and sound plus a complement of solid extras. Despite some weak aspects, Ben-Hur enjoys a special place in film history, and it deserves to be seen. This top-notch DVD release does the classic justice.